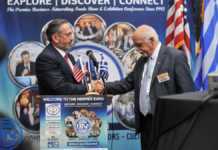 WASHINGTON, DC —The American Hellenic Institute (AHI) hosted a private dinner for Lieutenant General Alkiviadis Stefanis, chief of the Hellenic Army, September 20, 2017, at Metro 29 Diner, Arlington, Va. Lt. General Stefanis became the first Greek military officer to be inducted into the Hall of Fame at the National Defense University. The induction is considered to be an extremely high honor for foreign military officials. 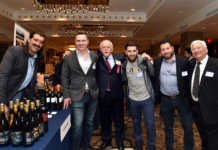 According to AHI President Nick Larigakis, the working dinner focused on the significant contributions of the Greek Armed Forces to NATO and U.S. interests in the region. 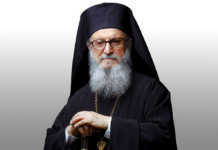 “In particular, we discussed how Greece and the United States can build upon their longstanding relationship by implementing specific initiatives that would make for stronger military-to-military relations,” he said. 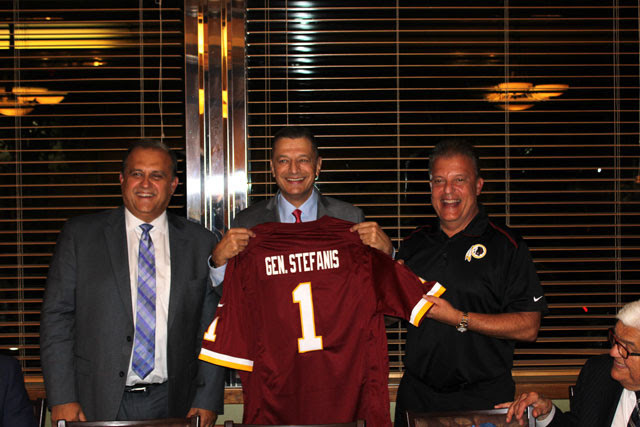 AHI President Larigakis and Larry Michael, senior vice president of Media for the Washington Redskins, presented Lt. General Stefanis with a custom Redskins jersey for his love of professional sports. Lt. General Stefanis presented Larigakis with a commemorative cadet (Evelpis) from the Greek Military Academy to thank AHI for its efforts. Thirty guests attended, including: Dean Popps, former acting United States Assistant Secretary of the Army for Acquisition, Logistics, and Technology; Dimitrios Angelosopoulos, Counselor & Consul, Embassy of Greece in US; Major General Vasilios Garmpis, NATO HQ IMS L&R Division at Brussels, Belgium; Defense Attaché Col. Panagiotis Kavidopoulos, Embassy of Greece; Merrick “Mac” Carey, CEO, Lexington Institute; Emanuel “Manny” Rouvelas, partner, K&L Gates, Ambassador Tom Korologos, former U.S. Ambassador to Belgium; Col. Scott Miller, Army attaché, U.S. Embassy in Athens, Greece; Wendy Stancer, Greek desk officer, U.S. Department of State; and Rohit Nepal, deputy director of Southern European Affairs, U.S. Department of State. Nick Larigakis (R) and Larry Michael (L) present Lt. Gen. Stefanis (C) with a custom Washington Redskins jersey. Dinner guests discuss U.S.-Greek military relations with special guest Lt. Gen. Stefanis.